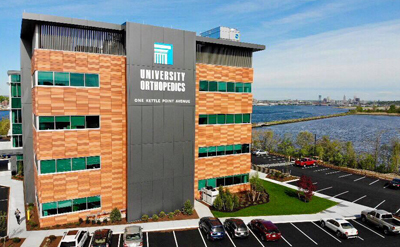 The physicians at University Orthopedics are united by more than a commitment to provide top-notch medical care to patients. They also share a determination to improve the field of medicine in which they practice, and to help pass on their skills to the next generation of orthopedic surgeons. Each physician on our staff is a member of the Brown Alpert Medical School faculty. We find that the vigorous exchange of medical knowledge that occurs in an academic setting renews our passion for orthopedic medicine, and improves the level of care we offer our patients. Many of our doctors are also involved in cutting-edge research that is shaping the future of orthopedic medicine. Our many research studies and clinical breakthroughs have helped to improve the level of orthopedic care throughout theworld, and our sustained involvement at the cutting edge of our field helps us incorporate the newest techniques into our clinical practice.